Become a Travel Plus Discounts member today! 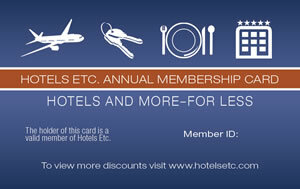 Join Hotels Etc Today and slash your travel and entertainment cost in half for life. You will receive your very own Hotels Etc Lifetime Membership Card and access to our member only section. You will never have to pay renewal fees or dues. 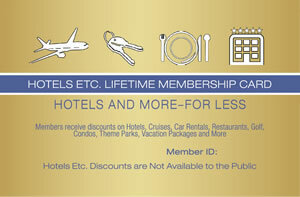 Your Hotels Etc Lifetime Membership card never expires and can be used over and over again with unlimited use. Annual memberships allow you to get up to 25% discount at Choice Hotels and rental car locations across the country and around the world. © 2019 Travel Plus Discounts All rights reserved.